The 1933 Duke Blue Devils football team represented the Duke Blue Devils of Duke University during the 1933 college football season. Hall of Famer Fred Crawford was a consensus All-American this year; the first from North Carolina. Duke upset Robert Neyland's Tennessee Volunteers 10 to 2. It was Tennessee's first loss in over two and a half seasons. It caused Neyland to say of Crawford: "He gave the finest exhibition of tackle play I have ever seen." The 1935 Duke Blue Devils football team was an American football team that represented Duke University as a member of the Southern Conference during the 1935 college football season. In its fifth season under head coach Wallace Wade, the team compiled an 8–2 record (5–0 against conference opponents), won the conference championship, and outscored opponents by a total of 214 to 45. James Johnston was the team captain. The team played its home games at Duke Stadium in Durham, North Carolina. The 1936 Duke Blue Devils football team was an American football team that represented Duke University as a member of the Southern Conference during the 1936 college football season. In its sixth season under head coach Wallace Wade, the team compiled a 9–1 record (7–0 against conference opponents), won the conference championship, and outscored opponents by a total of 208 to 28. Ace Parker was the team captain. The team played its home games at Duke Stadium in Durham, North Carolina. Both Clyde Berryman and James Howell named Duke as a retroactive national champion for 1936. The 1938 Duke Blue Devils football team represented the Duke Blue Devils of Duke University during the 1938 college football season. They were led by head coach Wallace Wade, who was in his eight season at the school. Known as the "Iron Dukes", the 1938 Blue Devils went undefeated and unscored upon during the entire regular season, earning them the Southern Conference championship. Duke was invited to the Rose Bowl against the USC Trojans. In what was the Blue Devils' first bowl game appearance, the contest was a scoreless defensive battle until early in the fourth quarter, when Duke kicked a field goal to take a 3-0 lead. However, USC threw a touchdown pass with one minute left to score the first and only points allowed by Duke during the season and win the game. The 1939 Duke Blue Devils football team represented the Duke Blue Devils of Duke University during the 1939 college football season. Dutch Stanley succeeded Carl Voyles as end coach of the "Iron Dukes". Halfback George McAfee led the team in rushing, receiving, scoring, kickoff returns, punt returns, interceptions, and punting. The 1941 Duke Blue Devils football team represented the Duke Blue Devils of Duke University during the 1941 college football season. The Blue Devils went undefeated in conference play, played in the Rose Bowl, and finished the season ranked number two in the AP poll. One minor selector, Ray Bryne, selected Duke as national champions. The 1943 Duke Blue Devils football team was an American football team that represented Duke University as a member of the Southern Conference during the 1943 college football season. In its second season under head coach Eddie Cameron, the team compiled an 8–1 record (4–0 against conference opponents), won the conference championship, was ranked No. 7 in the final AP Poll, and outscored opponents by a total of 335 to 34.The team ranked first among the nation's 76 major college teams in both scoring offense (37.2 points per game) and scoring defense (3.8 points per game).The team played its home games at Duke Stadium in Durham, North Carolina. The 1944 Duke Blue Devils football team was an American football team that represented Duke University as a member of the Southern Conference during the 1944 college football season. In its third season under head coach Eddie Cameron, the team compiled a 6–4 record (4–0 against conference opponents), won the conference championship, was ranked No. 11 in the final AP Poll, and defeated Alabama in the 1945 Sugar Bowl on New Year's Day. The Blue Devils outscored opponents by a total of 230 to 118. The 1945 Duke Blue Devils football team represented the Duke Blue Devils of Duke University during the 1945 college football season. Duke won the 1945 Southern Conference Championship, and finished the season ranked 13th in the final AP poll. The 1952 Duke Blue Devils football team represented the Duke Blue Devils of Duke University during the 1952 college football season. Duke won the 1952 Southern Conference Championship, and finished the season ranked 16th in the final AP poll. The 1953 Duke Blue Devils football team represented the Duke Blue Devils of Duke University during the 1953 college football season. Duke won a share of the 1953 ACC Championship, and finished the season ranked 18th in the final AP poll. The 1954 Duke Blue Devils football team represented the Duke Blue Devils of Duke University during the 1954 college football season. Duke won the 1954 ACC Championship, and finished the season ranked 14th in the final AP poll. The 1955 Duke Blue Devils football team represented the Duke Blue Devils of Duke University during the 1955 college football season. The 1958 Duke Blue Devils football team represented Duke University during the 1958 NCAA University Division football season. The 1960 Duke Blue Devils football team represented Duke University during the 1960 NCAA University Division football season. The 1961 Duke Blue Devils football team represented Duke University during the 1961 NCAA University Division football season. Duke won the ACC championship with a record of 5–1 in conference play. They were ranked 20th for their regular season finale against Notre Dame on December 2. The 1962 Duke Blue Devils football team represented Duke University during the 1962 NCAA University Division football season.Duke won their third consecutive ACC Championship with a record of 6–0 in conference play. They were ranked eighth in the polls for their season opener against USC, but dropped out of the rankings following their loss and were not ranked again for the remainder of the season. The Blue Devils declined an invitation to play in the 1962 Gator Bowl. The 1971 Duke Blue Devils football team represented Duke University during the 1971 NCAA University Division football season. The 1989 Duke Blue Devils football team represented the Duke Blue Devils of Duke University during the 1989 NCAA Division I-A football season. The 2008 Duke Blue Devils football team represented the Duke University in the 2008 NCAA Division I FBS football season. 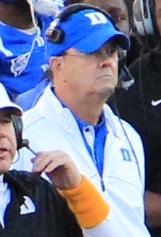 The team was led by head coach David Cutcliffe. They played their homes games at Wallace Wade Stadium in Durham, North Carolina.